Weaving by beads – one of ancient arts and crafts. Weaving by beads on the African continent arose, and on today's it is known worldwide. For beginners weaving by beads can open unknown open spaces for creativity. That only you will not see at masters of this remarkable art: both beaded trees, and beaded toys, both jewelry, and decorative accessories for the house, and a lot of things many other things. 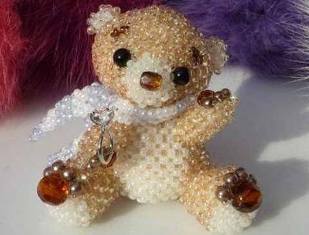 Hand-made articles a beginner are recommended to be made of beads according to already ready schemes is will help not to be mistaken in calculation of beads, sequence of receptions. Such schemes of weaving from beads can intend for so-called 2D, i.e. flat, and 3D, i.e. volume, hand-made articles. Weaving by beads for beginners is recommended to be studied from flat articles. 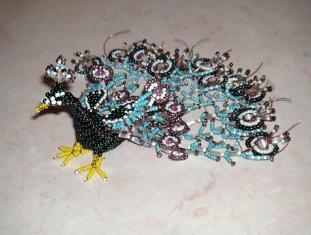 One of favourite beginners of schemes of beadwork are schemes of weaving of toys animal. 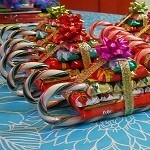 It is possible to decorate with such amusing and beautiful toys the house or to please children. 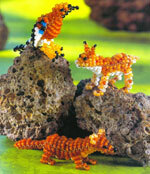 There are schemes of weaving by beads of animals for beginners with the different level of preparation. For example, it is possible to weave a nice crocodile. Weaving of a product of 9х12 in size requires 125 pieces of beads of green color, 150 yellow biserin, 1 black, 2 bright (blue, red, etc. ), a scaffold. Necessary length of a scaffold pays off, proceeding from the size a biserinok. Large beads will require 1,75 m of a scaffold of 0,25-0,3 mm. For beads of the average sizes – 1,1 m of a scaffold of 0,2-0,25 mm. The crocodile is carried out in technology of parallel weaving. For performance of parallel weaving on a scaffold biserinka of the first and second ranks are strung at once. Then one end of a working thread is passed through all biserinka of the second row towards to other end. After that both ends of a scaffold should be pulled properly "against the stop" so that all biserina were placed in the middle of a scaffold. Further weaving by beads is carried out by the same principle: on a scaffold all are strung row biserinka according to the scheme of weaving, and then by a counter nizaniye of a biserinka are fixed. The full scheme of weaving by beads of a crocodile is given below (fig. 1). Similarly, i.e. in technology of parallel weaving it is possible to weave also other amusing animals – a turtle (fig. 2), a dog (fig. 3), a spider (fig. 4). If the product has to hold well a form (as, for example, the spider and his "pads"), then weaving by beads is carried out on a wire. Figure 1. 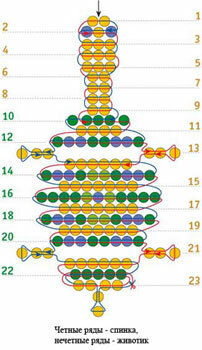 Weaving by beads for beginners: scheme "crocodile"
Figure 2. 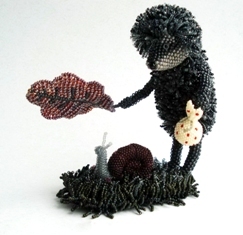 Weaving by beads for beginners: scheme "turtle"
Figure 3. 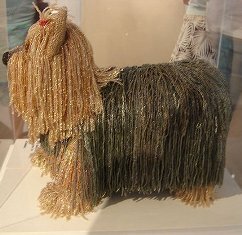 Weaving by beads for beginners: scheme "dog"
Figure 4. 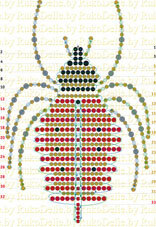 Weaving by beads for beginners: scheme "spider"